Popularly known as Amma, Mrinalini, danseuse, Padma Bhushan awardee and wife of Indian scientist the late Vikram Sarabhai, passed away Thursday. 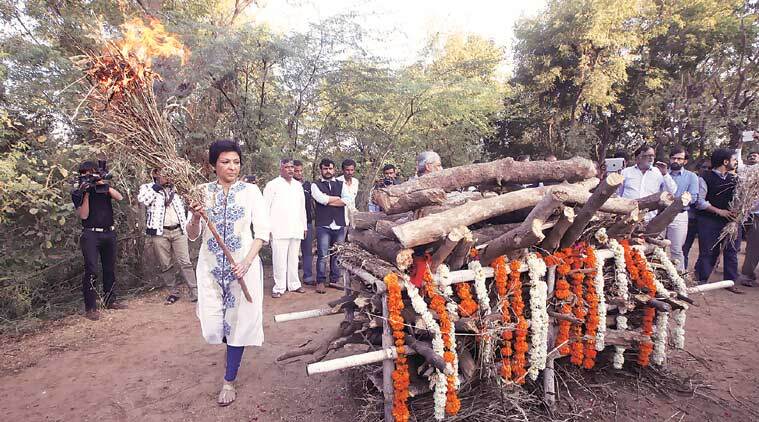 “I’m sorry Amma,” Mallika Sarabhai said as she laid a heavy block of wood on the frail body of her mother Mrinalini Sarabhai at their farmhouse in Pethapur area of Gandhinagar, just before she lit the pyre alongwith her brother Kartikeya. Popularly known as Amma, Mrinalini, danseuse, Padma Bhushan awardee and wife of Indian scientist the late Vikram Sarabhai, passed away Thursday at 97 due to age-related complications at her Usmanpura residence in Ahmedabad, alongside which she had founded the Darpana Academy of Performing Arts in 1949. Draped in a red saree, black strapped large-dial watch on left wrist, a large bindi on forehead and ghungroo on her feet — all her signatures — Mrinalini’s body lay on the dance floor of the academy she had founded. In a befitting tribute, her last journey started from the Darpana Academy dance floor with Mallika performing to Krishna Nee Begane Baro, a popular Carnatic composition in praise of Lord Krishna. Other senior students stood around the body covered with rose petals, depicting dance mudras. A bevy of students — belonging to varied age groups from among the 18,000 who graduated from the academy, neighbours and well-wishers trickled in to say the last goodbye to the danseuse. Her grandchildren and great grandchildren were also part of the ceremony. As news of her death broke, political leaders such as Anandiben Patel, Mamata Banerjee, Oommen Chandy and Ahmed Patel, besides sports personality Harsha Bhogle, took to Twitter to express condolences .